Home Technology How Does Touchscreen Work? How Does OLED Work? How Does Touchscreen Work? How Does OLED Work? What enabled smartphones to dominate as a technology to be so prolific and critical to our lives that we would rather lose my car keys or wallet than my smartphone? The answer to this question isn't a simple one-liner but rather it's a combination of answers app development, wireless internet carrier networks though we would argue the most important contributor was the seamless combination of different functions and technologies into a single package. Today, we're going to explore the most distinctive feature of the smartphones merging of technologies, the touchscreen display. There are three technologies in the touchscreen display these technologies are combined all on top of each other. When you felt and used a smartphone for the first time you just knew that you are holding something revolutionary, something different from all previous phones. These were not new technologies many devices used a tactile interface and color displays had already been the standard for most phones. Even toughened glass had been discovered in the 1800's but the innovative element was combining them seamlessly. One layer on top of another like magic. Let's get into the layers of a touchscreen display, On the top, we have the protective glass. A lot of us have had a screen shatter but think about how many times you've dropped it and it hasn't, that's because of smartphones glass is over five times stronger than normal glass and before. The first iPhone showed up in 2007 the standard four cell phone screens was plastic and although plastic doesn't shatter it is very easily scratched. Related Article: Light Emitting Diode - How LED Work? If the screen were covered in plastic it wouldn't last a week sitting in your pocket next to your keys before having dozens of scratches all over it, So what makes toughened glass so much stronger? A smartphones glass is an alumina silicate glass that is toughened by soaking it in a bath of potassium nitrate. This causes the sodium atoms in the glass to migrate out and much larger potassium atoms to take their place because the potassium atoms are much larger, they generate a substantial compressive force on the surface of the glass. Here's a quick analogy, imagine filling the backseat of a car with three average-sized people they fit snugly but if you push them they're still able to move. Now replace those three people with three football linebackers those linebackers are just flat-out stuck unable to move. It would take much more force to move those linebackers from their seats. This is the fundamental concept behind what makes toughened glass special. The atoms are compressed so it would take much more force for the glass to break. Below the toughened glass is a projected capacitive touchscreen that senses the presence and location of conductive materials such as your fingertip. This touchscreen is composed of two transparent diamond grid patterns printed on polyester with an optically clear insulator in the middle. The diamond grid pattern is printed with a transparent material called Indium Tin Oxide or ITO which acts as a conductor. Let's take a closer look at how it works? Suppose, we build a bunch of electrons on the blue diamond however because there is an insulator in the way the electrons cannot move. The electrons generate a negative electric field which causes a bunch of positive charges to build up on the yellow diamond. this is called a Capacitor. Now when we move a conductive material such as the tip of your finger close to this capacitor it disrupts the electric field which changes the number of positive charges that build up on the yellow diamond. The change in positive charges on the yellow diamond is measured and the processor registers this as a touch. The location of the touch is detected by scanning the charges or voltage along the blue diamonds, while actively measuring each yellow diamond column. Note that each row of blue diamonds is connected together also each column of yellow diamonds is connected. This setup makes a grid of blue columns and yellow rose just to clarify again. All of these components are made with transparent materials. Measuring each point requires too much circuitry so we only measure each column. The charge or voltage gets sent to each row in quick succession so the processor can register multiple touches at once. Below that is a display which uses LCD or OLED technology. While the LCD and the OLED display both produce high-quality images. Today we are going to focus on the OLED technology as it is the standard in most new smartphones. OLEDs stands for Organic Light-Emitting Diode, the high-resolution OLED display is what generates the high-quality images that we see whenever we look at our smartphone. In 2018, high-end phones can have over 3.3 million pixels that mean there are 10 million microscopic individually controls dimmable red green and blue lights in the palm of your hand. Take a moment and think about the engineering level required to control let alone design and manufacture that many microscopic lights. OLED displays are composed of a massive grid of individual pixels and in each pixel is red, green and blue sub-pixel. Each sub pixels light intensity is controlled by a small thin film transistor that acts as a dimmer switch. There are many layers structures in each sub-pixel. Photons are produced in the sub-pixel by electrons that are driven from the negative to the positive terminal there is an emissive layer between negative and positive terminal. When they pass through the middle layer called the emissive layer photons are emitted through a release of energy. The compounds used to make up the emissive layer determines the color of the light emitted and the intensity of this light is dependent on how many electrons pass through. This explanation is greatly simplified but the research engineering and science behind OLEDs is extensive. In fact, the 2014 Nobel Prize in Physics was awarded to three researchers for their discovery of efficient blue light-emitting diodes. Let's summarize, on the bottom is an OLED display composed of up to 10 million EVP two little-colored light. 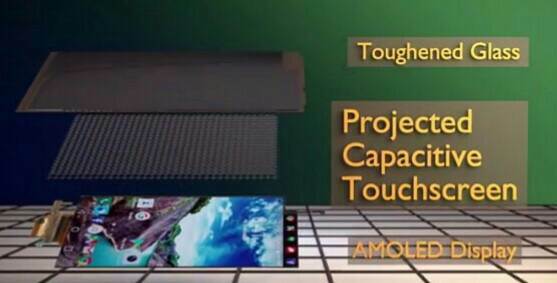 On top of that is a transparent projected capacitive touchscreen that can sense one or multiple touches at a time and on top of that is strengthen to a glass that protects your screen from scratches and most Falls.